Aircharge, the global leader in Qi wireless charging solutions for public venues, the office and home, has confirmed today full compatibility with the newly announced iPhone 8/8 Plus and iPhone X models. Both Aircharge and Apple utilise the universal standard for wireless charging of smartphones and other consumer electronic devices, Qi. Aircharge is the world’s largest deployer of wireless charging facilities in public venues and via the Aircharge Locator app provides access to 5,000 locations globally including restaurants, cafes, shops, hotels, airports and train stations. Aircharge offers a safe and convenient method of bringing wireless power to a surface or table-top, enabling any smartphone to charge wirelessly. Owners of the new iPhone X, 8 and 8 Plus models will be able to charge their devices by simply placing them on the Aircharge surface charger. Previous iPhone models without the built-in wireless charging capabilities are also able to charge thanks to the use of the Aircharge “Orb”- the world’s first and only multi-head connector carrying both the Qi and Made for iPhone (MFi) certifications which allows any Lightning, Micro-USB and USB Type-C devices to charge from the charging unit. “We’re a long time partner of Apple via its MFi program and we’re excited Qi wireless charging is now a standard feature in the new iPhone models. The inclusion of wireless charging from a major mobile phone and tech manufacturer like Apple will accelerate and drive widespread consumer awareness and mainstream adoption”, said Steven Liquorish, founder and CEO of Aircharge. Globally renowned brands like McDonald’s, Starbucks, YO! Sushi, Costa Coffee and Vapiano are among the first to deploy Aircharge in their venues, enabling their customers to top up whilst enjoying a meal or refreshment. McDonald’s, the largest provider to date, currently include the service at more than 400 UK stores and has begun deployment in 14 regions. 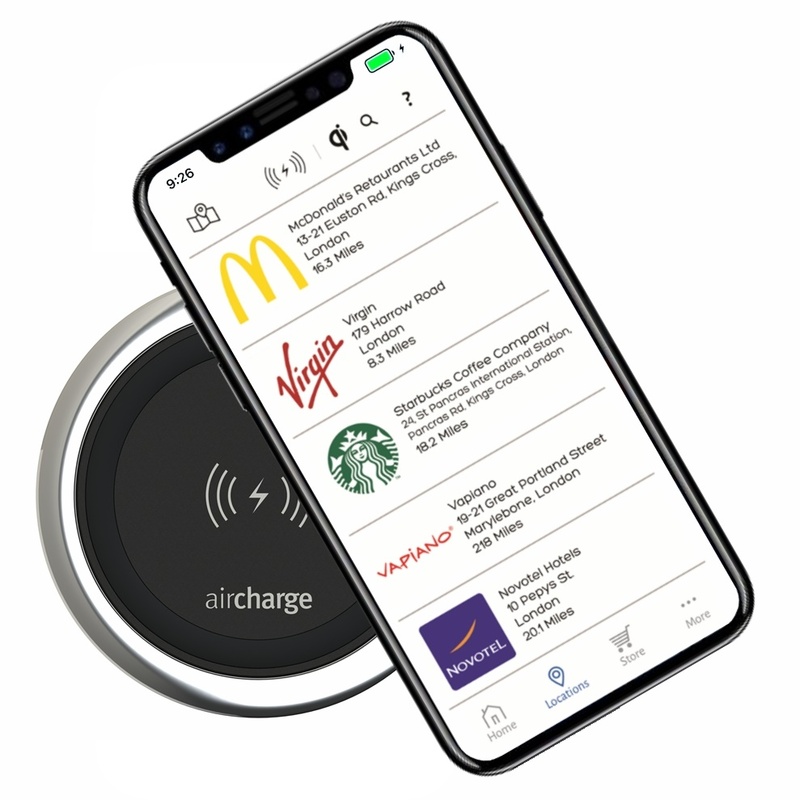 In addition, Aircharge provides wireless charging at Virgin Atlantic Clubhouses in Heathrow and Gatwick airports, Emirates Lounges in Dubai International and Finnair Lounges in Helsinki-Vantaa. Eurostar offers Aircharge wireless charging to their customers visiting their Business Premier Lounges at London St Pancras International and Paris Gare du Nord. Virgin Trains has deployed across its First Class lounges along the East and West coast routes in the UK. Hotels offering Aircharge include Premier Inn, IBIS and Novotel. Aircharge is also available in major mobile network stores, including Vodafone, O2 and EE as a complimentary service for customers visiting their retail stores, and in leisure centres like Virgin Active Health Clubs. Founded in 2013, Aircharge’s vision is to allow users to charge their mobile devices wirelessly throughout the course of the day, without the need for carrying a wire or battery pack. “As we have all become increasingly dependent on mobile devices, we are now likely to charge the battery more than once per day with the challenge of finding accessible power sources when on the go. By using the Aircharge Locator app, users can easily navigate to the nearest Aircharge point to get instant, free power”, added Mr. Liquorish. London is currently the first unique global wireless charging hub, providing a city-wide deployment of public charging points. 1,100 locations are now available in the UK, with more coming in Europe, the US and the rest of the world. Aircharge is also an official partner of BMW, Mercedes-Benz and Lexus, offering accessories and solutions for the car, home and office and is the only brand to offer a full range of Made for iPhone certified wireless charging cases for non-Qi iPhone models. With more than 90 Qi certified models of smartphones, 80 models of cars and over 900 wireless charging accessories available on the market, the Aircharge ecosystem is only expected to grow further.